CAMPAIGNERS seeking redress for "cracking and crumbling" homes have spoken to the minister in charge of housing ahead of the group's first meeting with the expert panel investigating the issue of defective blocks. 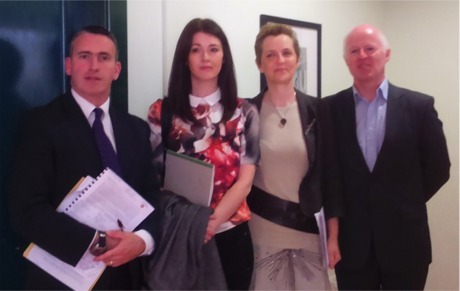 The Mica Action Group (MAG) yesterday discussed the ongoing investigation with Minister for Housing and Urban Renewal, Damien English and Donegal TD Joe McHugh, in advance of their meeting with the expert panel on Monday, October 17. Mica Action Group secretary Ann Owens said the group was given a number of assurances by Mr English including the careful setting up of the terms of reference of the investigation and speedy action on the panel's report. “MAG expressed the importance of the panel engaging with all stakeholders called out in the terms of reference of the investigation - homeowners, MAG, local authority and relevant manufacturers - to ensure a complete picture is given of the issue. The minister assured us that this engagement is ongoing and communication with all stakeholders will continue," said Ms Owens. If you think you are affected by defective blocks issue you can register at www.surveymonkey.com or contact the Mica Action Group on www.facebook.com .